Hello! 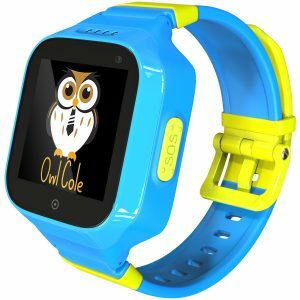 Thank you for getting our 2019 Newest 3G GPS Tracker Phone Watch for kids Owl Cole! If the watch is On, please shut it down __ Settings – System – (Roll down) – Power – Shutdown. Insert the sim card into the watch(follow the picture). Make sure it’s NANO card (same size as the one used in iPhone). The SIM card must support 3G network and show callers ID. Push it all the way in using your nail or some tool. It has to click in. Restart the watch by long pressing the SOS button. Download the APP SeTracker or SeTracker2 for free from AppStore or Google Pay Market. You can scan the QR code from the box for a quick access, download and install the application. When the installation is completed, start to register your personal account. Register code is the ID number of the watch ( the top sticker at the back of the watch, called REG CODE). When the registration is complete, try to log in. Log in and find the setting, click the phone book and save the numbers you need. The same goes for the other functions. Set a SOS numbers(Mom/ Dad / Brother). 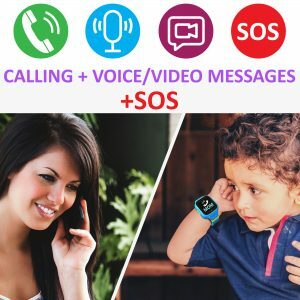 By long pressing the SOS button the watch will start calling SOS numbers saved 1 by 1 till someone will answer. Please note, watch takes Voice mail as answered call. Only those numbers saved in phone book or contacts have the privilege to call the watch, we suggest adding baby’s friends too. You should save the numbers in App, so the watch will be able to call these numbers. Remember to click the save button. A: To call the phone. 1) Find the Phone book in the watch menu and click the number you need to call out. 2) Keep pressing the SOS key for few seconds to activate SOS. 3) Press the Red Button on the screen to cancel the call. B: To call the watch, just dial the number associated with the sim inside the watch. You should save your number in the app by now. Touch the Green button on the screen to answer, the Red Button to cancel the call. 1): Turn on the watch and make sure that it has signal bars. 2): Open the Map on the APP, click the location then it will show your baby’s real-time position. NOTE: When the kids are indoors, it will locate the position via LBS. The deviation which is inevitable depends on the distance between the watch and the base station and other environmental factors. 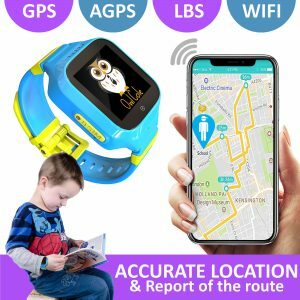 When the kids are outside, it will switch to GPS location automatically, it would be much more accurate, but it will change according to kids’ movement. Positioning deviation is inevitable, it can not be regard as quality issues. 3) For more accurate location please Switch the WIFI ON on the watch Settings-Wireless&Network-WiFi ON. 1: The SIM card must support 3G(WCDMA) or 2G(GSM) network. 2: Has 3G/ 2G data base. 3: Can show callers ID. What sim may I use for US? For USA we suggest to use AT&T, T-Mobile or Speedtalk GSM. May not work with Sprint or Verizon. 2. Would it work outside US? Current setting of 3G model will work for North and South America. Would not work in Europe, Asia, Africa or Australia due to WCDMA frequency difference. 3. I’ve just inserted the sim and the watch still asking to install the sim. Please shutdown the watch Settings-System-(Roll down)Power-Shutdown. make sure, that you pushed the sim all the way in till it clicked in. And Turn On the watch again by long pressing the SOS button. 4. I don’t get any signal bars. Sometimes it takes up to 72 hours for a watch to sync with the app ( depends on carrier). Usually it happens right away. APN set up may be needed. 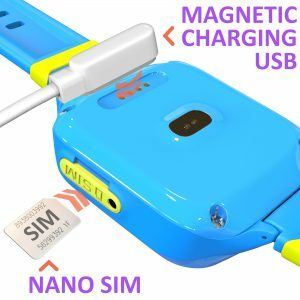 Send a direct text message to the sim inside the watch. 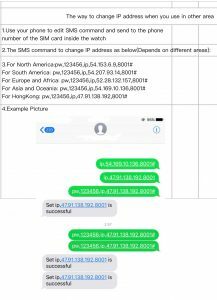 For a Speedtalk GSM it will be pw,123456,apn,mobilenet,,,310260# if the sim APN is mobilenet (it is printed on the SIM card usually) or pw,123456,apn,wholesale,,,310260# , if the APN is wholesale. Please note, when you do this, have the sim installed into the watch and keep it on. You will get a response message to your cell phone within 20 min, it means, that APN set up was successful. 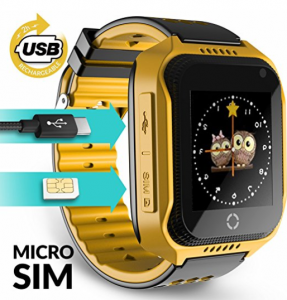 If still no luck, maybe your sim is not compatible with the watch. Please contact us. 5. Can I set up the Time manually? Yes, you can . Settings-System-Date &Time- Select automatic or set up manually. 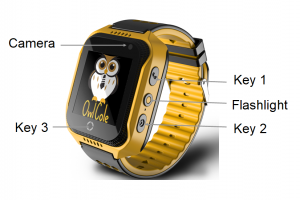 Thank you for getting our Smart watch for kids with GPS Tracker Owl Cole. Here is a quick guide to your easy setting up the watch. Step 1. Please recharge the watch. Step 2. Insert the proper Micro Sim card, which supports 2G Network, offers you a Voice call and may show callers ID. Open the rubber cover, put the card into the slot, chip facing up. Restart the watch after inserting the card successfully, then wait for the signal and start to operate following the next step. Scan the QR code from the box with your cell phone, download and install the app. Or searching APP name: SeTracker or SeTracker2 from Apple store or Google Play to download and install it. When the installation is completed, start to register your personal account. Scan the REG CODE from the back of the watch(please don’t confuse it with IMEI), insert your email, name of your child and a password. Select an APP language: Very important! Choose your location properly(North America, South America, Europe and Africa, Asia and Oceania, Hong Kong). Log in into the app using your login and password. Find the settings, click the phone book and save the numbers you need. The same goes for the other functions. Only those numbers saved in phone book have the privilege to call the watch. We suggest adding baby’s friends too. You should save the numbers in App, then the watch can call out these numbers. And remember to click the save button. 1): Turn on the watch and make sure that it has signal. It’s good when you have 4 bars signal. If less, please take the watch with you outside to the public area with a strong mobile network to set up. 2): Open the map on APP click the location then it will shows your child’s real-time position. Notes: If the watch is indoors, it usually position yourself via LBS, and the deviation is inevitable, which depends on the distance between the watch and Base Station and the environment as well. If you’re outside, it switch to GPS automatically, the range of deviation will also narrowed, but will still become unstable while the watch moved, which is normal. Slide the screen to find the surface of phonebook, click enter into it, it shows the numbers you saved before in APP. Choose the phone number to call out. or press Key 2 for few seconds to call 3 SOS numbers one by one, if the first one or the next one didn’t answer and will not end until the second round. Please note, to call SOS you need from the blue screen with the walking boy, not from the black screen. Short press key 2 to cancel the call. To call the watch with your phone – just dial the mobile number of the watch, when the device receives a call, press Key l or 3 to answer, press Key 2 to cancel the call. Log in and find Remote Camera, click it to take photos, refresh frequency 30 seconds. Click photos to amplify or rotate 90 degrees, also can check photo date. Slide screen find the surface of flashlight, click it, enter into it, you can choose On or Off. Your child make take a pictures, but there is only one picture may be stored in the watch at the same time. But many of them may be stored in the app. The child need to select Album-Image-Upload. Q: How do I set up the correct time? A:You need to select a correct Time zone. For example, if you are in Los Angeles, it will be West:GMT-8:00. Summer time ON. If you are in Dallas – West:GMT-6:00. Summer time ON. If you are in New York – West:GMT-5:00. Summer time ON. 2. Q: I can’t set up the watch. There is no mobile signal. A: For your comfort use we can suggest a Speedtalk GSM sim with a $5 GPS Tracker plan. Smartwatch plan makes you choosing between calls and 2G data network for GPS. You need both, so please pay attantion and activate a GPS Tracker plan. During the first 24 hours from the activation the signal may be not steady. The sim card need to support a 2G Network a offer you Voice call and data. Some latest 4G Network sim cards may not support the device so well. Try to check if there is a mobile signal in some other public areas of your city. If yes, you can set up. Type your address and look for the Indoor Residential ACTIVE. 3. Q: I can not add the numbers to the phonebook. It says, that device is offline. A: Please check, when you login into the application, if you selected your location properly, like North America. Its a common reason for device being offline. If you missed this step when registering, please delete your device from the application by Selecting Me-Device list-Edit-Delete. And register it again by scanning REG CODE under different email with correct location. Also some sim cards requires activation in the cell phone. So please insert it into the cell phone, activate it, pay the balance. And when you will be able to make and accept calls, please insert it into the watch. Make sure, that the signal is good(4 bars),otherwise set up the watch in open public area with a strong mobile coverage. 4. Q: I tried all of the above and still can not send commands to the watch. I have 3-4 bars signal. Instead of setting the APN through the application, you can also send a direct text message to the sim inside the watch. So the code is pw,123456,apn,apn name,,,mccmnc# Put into it your APN name, MCC and MNC. This is the mobile provider settings. Please NOTE : for the most of mobile carriers it takes up to 3 days to get fully activated and sync with the app. If i’s been more then 3 days, you selected your location properly and APN doesn’t help , please contact us. If you have more questions, Send us a message from Contact me form with detailed info and your IMEI from the back of the watch. 5. Q:can my husband/wife also track our child from his/her phone? A: Yes, sure. You can use a same application account (login and password). 6. Q: Is there any other application I can use? A: You can use applications SeTracker and Setracker2. Same thing with different interface. 7. Q: I would like to use in the other country. A: Sure, but first you need to find a proper micro sim card in your country, which supports 2G Network, offers you Voice call and Data. Then you need to activate this card in the cell phone, pay the balance. See, if you are able to make calls already. If yes, put the sim into the watch. 8.Q: I would like to use it in Iceland with Vodafone. A: Here is a quick guide to set up in Europe. – When you register in the app, it’s very important to select Europe and Africa as location. – The full sim activation usually takes up to 3 days to get synchronized with the watch, when the balance was paid. – Also you can send a text message pw,123456,ts# do double check, if it was successful from the message back. Try them both one by one. if you will get a message back, it was successful.